As building owners have increasingly realized the cost benefits of completing roof restorations rather than reroofing, the demand for roof coatings has similarly grown. The global coatings market stands at approximately $9 billion as of last year, and is projected to double by 2021. (These numbers were obtained from “Elastomeric Coating Market Worth 13.58 Billion USD by 2021,” which can be viewed here.) Roof and wall coatings certainly comprise a substantial portion of this. Building owners are investing in roof assets more than ever, as roof coatings afford more options than the former protocol of doing nothing until complete tear-off. The emphasis on and demand for higher-quality coatings with longer life cycles has never been more prevalent. External factors such as the continued prominence of reflective coatings, legislation restricting volatile organic compounds (VOCs), and interest in sustainable products are also critical. As market trends and customer needs evolve, so too must the manufacturers who supply solutions. Perhaps the paramount development in the coatings market in the past 10 years has been the shift from implementing short-term ‘quick fixes’ to longer-lasting and more cost-effective roofing solutions. Life cycle cost analyses have become an increasingly common and helpful resource for building owners and property managers—these decision-makers are realizing restoring a roof with a high-quality coating is more cost-effective in the long term than either reroofing or applying a lower-quality coating. The increased growth in the coatings market supports the trend of facility managers more proactively investing in their roof assets. It is imperative to remember the initial cost of a roof is only a portion of the total cost of ownership over its lifespan. While cheaper coating options may initially save a few dollars, the inevitable recoating requirement in the next three to five years will be exponentially more costly in time, labour, and material. Given these additional costs, it is a much wiser decision to invest in a superior, more durable coating from the beginning—one that will be serviceable for a decade or longer. This photo shows the application of cold-process adhesives. 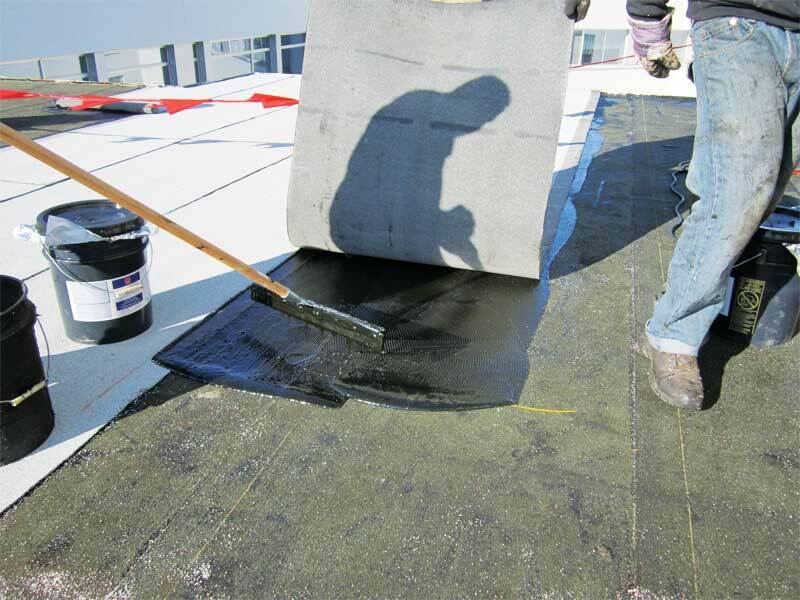 Cold-applied adhesives have increased cold-temperature flexibility and improved ultraviolet (UV) resistance, which extend the life of the roof. Another trend gaining momentum in the coatings industry is the increasing popularity of reflective—primarily white—coatings, as building owners begin to realize high-quality reflective coatings save money over their service lives through their reduction of energy costs. (An article on the growth of this trend in the United States, “Increasing Demand for Roof Coatings,” was published in April 2012.) In cooler climates, reflective coatings remain popular due to their crisp, sleek esthetic appeal, and can still offer owners some energy expenditure relief. These coatings—which are most often acrylics, polyurethanes, silicones, and polyvinylidene fluorides (PVDFs)—tend to be lower in VOCs than their bituminous-based counterparts, and can provide energy savings for building owners. Reflective coatings are often seen as synonymous with white coatings, but they can also be aluminized. Both aluminized and white reflective coatings keep buildings cooler by protecting the roof from the sun’s harmful ultraviolet (UV) rays, and can aid in extending the service life of the entire building envelope. Coatings with reflective properties are also less vulnerable to drying out and cracking than coatings or roofs left with bare cap sheets, exposed asphalt, and even wall joint-sealants. Preventing such premature aging is the first step toward preventing leaks. As more data continues to compile citing the environmental and cost benefits of reflective roofs, their popularity will only continue to grow.